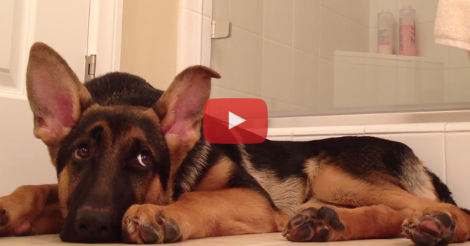 His Owner Starts To Sing In The Shower And This Dog Has Had Enough! His Reaction Is Priceless! Dogs are said to be man’s best friend. It just might be true – a friend will nod politely as you show off your hidden talent for singing. A BEST friend will tell you to stop singing because you’re making their ears bleed, or join in even worse than you just to add to the noise. I’ve found this to be very true. My best friends will tell me even the hardest truths, and I appreciate them even more for that. This dog is definitely this man’s best friend. This guy starts singing in the bathroom. It’s only a little off-key, but he pursues! After a few notes, his best friend – a German Shepherd lounging on the floor nearby – feels compelled to sit up and beg him to stop. When that doesn’t work, he joins in just like a best friend would! Sing away, my friends! Most dog lovers will attribute this reaction to “pack behavior” retained from thousands of years of breeding as it is how wolves in the wild communicate. Some dogs will howl naturally, and some need to be taught. My two dogs never howled until I dog-sat a Husky who howled at a passing car. All howl broke loose in my home that day. Since then, they don’t howl as often without their Husky friend, but once they learned, they never forgot. What do you think of this quirky video? I think it’s a true testament to the relationship between a man and his dog! 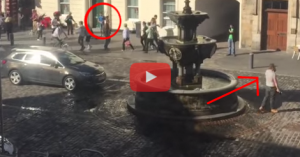 When This Hate Monger Refused To Leave The Square, A Young Boy Decided To Take Matters Into His Own Hands! 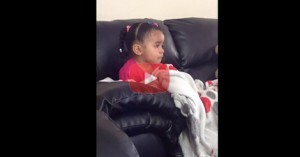 It’s Too Funny!